As Vancouver's street food experiment enters its second year, there has been the good, bad and the ugly. I think this has to do with the randomness of issuing permits the first time. Apparently, the second round was a bit more comprehensive. I guess we won't know the results until the new carts start appearing on a Downtown corner near you (or not near you, since many do not live or do business in Downtown). One of the newest carts it one offered up by La Brasserie. For those who are unfamiliar, La Brasserie is a popular bistro on Davie which serves up Alsatian cuisine. Simply tagged as La Brasserie Street, there is only one item available. And that one item is the Brass Chicken Sandwich. It is beer-brined rotisserie chicken with gravy and crispy fried onions on a buttermilk bun. Seeing how there is only one item on the menu, it's easy to guess what I had... 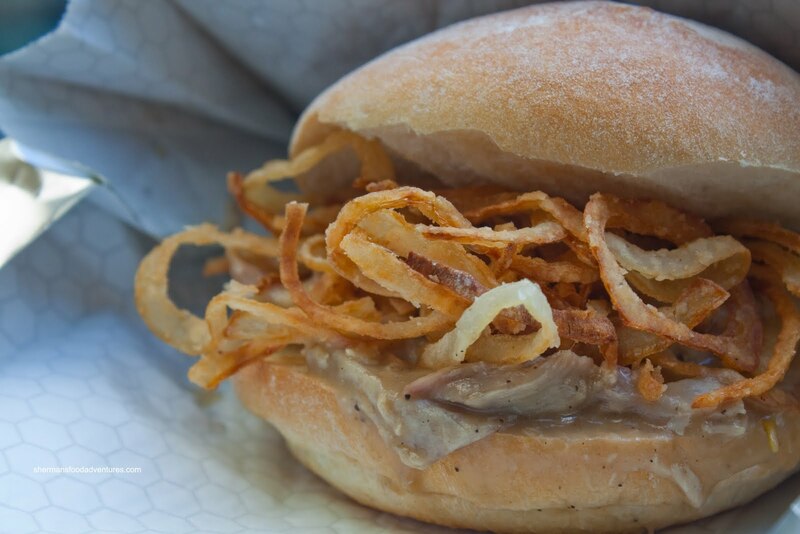 The first thing anyone will notice about the sandwich is the plethora of aesthetically-pleasing fried onions. So much so, it somewhat hides the chicken and gravy. But with one bite, the gravy really makes its presence known by slowing dripping down your fingers and hand. For me, I love this, the messier the better. For others, I can see this as a potentially disastrous affair with work attire. Then again, the sandwich comes with a really substantial bag which keeps everything where it should be. As the visuals suggest, the most noticeable ingredient is the fried onions. Texturally, they provide a light crunch and plenty of oniony sweetness. 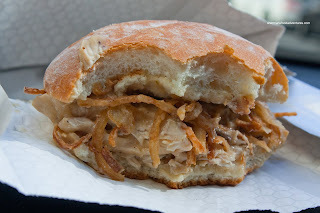 The chicken is merely a bystander for the rich gravy and onions. The buttermilk bun was an easy chew while still holding up to the moisture. All-in-all, a solid sandwich. 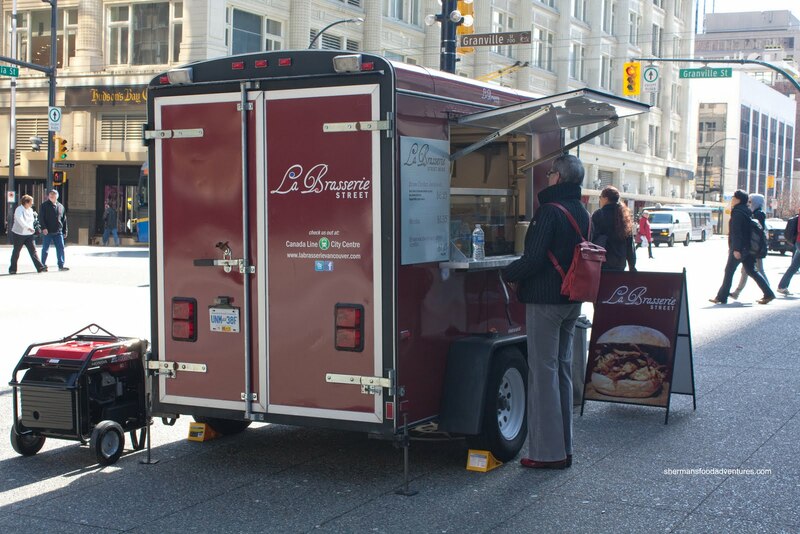 A fine addition to the street food scene in Vancouver. How interesting to only specialize in one thing. I love the concept for a food truck since it would make the process much quicker and allow for better quality control. I hope their truck is a success. It's been interesting seeing how the food trucks have fared this past year. Some have managed to thrive whereas others have been inconsistent and thus have closed up shop. I am anxious to see how the experience of the past year will give shape to the next batch coming. Very cool. I had no idea this was around. Thanks for sharing. Hope they'll get some more thing son the menu. I agree, one item makes it easier and probably better. I am anxious as well to see if the new batch have learned anything from the previous ones. @Darina, not sure if they should add anything new. The cart is small and it might make things chaotic.